Oh so this is what Apple's Bumper cases look on the black iPhone 4. You know, the only color that is available to purchase from Apple. Ever since Apple released the iPhone 4 and the Bumper cases, Apple's online store only displayed the Bumper cases on white iPhone 4s instead of black or even both like they do now with the iPad 2 and Smart Covers. Other reports have said the Apple completely removed every single trace of the white iPhone 4 graphics on their online store. This was long over due. 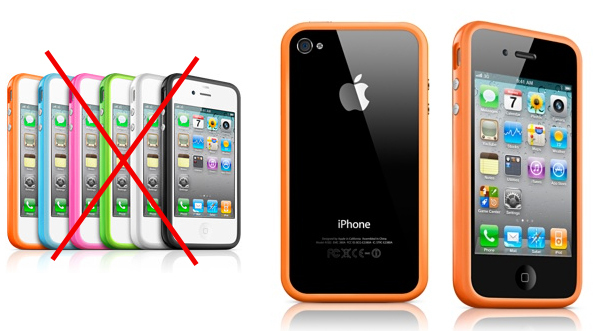 Well at least now it's easier to pick out the colored Bumper of your choice for your black iPhone 4. This case caught my attention, it's called the Glam Rocka by More. Thing. It's essentially a jelly polymer bumper style case for the iPhone 4 with a more interesting look. The pyramid texture on the sides looks like it would provide a decent amount of grip to your iPhone 4. 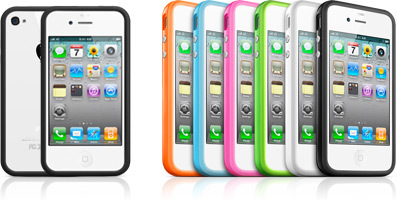 The Glam Rocka is made to snugly fit around your iPhone 4 and it's available in five colors for $12.90, not bad eh? You might recall these Apple Bumper cases for the iPhone 4 selling for extremely high prices on eBay when Apple decided to stop selling them in-store and online back when the free Bumper case program was live. Now Apple once again made these $29 Bumper cases available both online and in-store. All colors are available now and ship within 24-hours. Now we can all taste the rainbow! Case-Mate has released their new Hula case for the iPhone 4. The Hula is very similar to Apple's Bumper case with one difference, it has a clear plastic middle to show off your iPhone 4's metal bezel in between the colored silicone frame. The Hula combines two materials, impact resistant silicone edges and a clear TPR plastic. 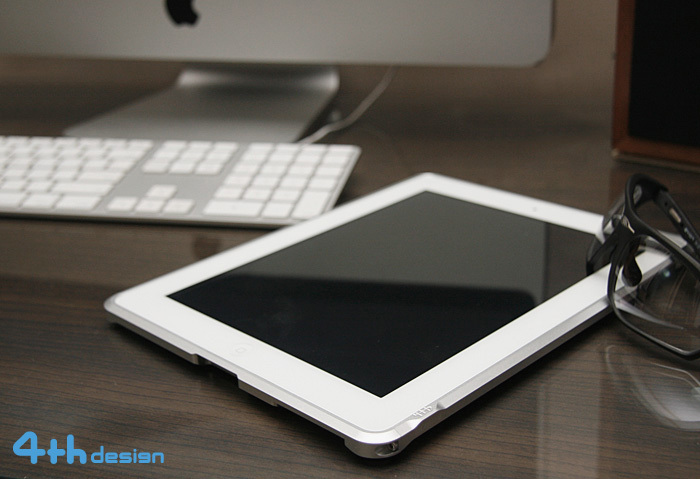 With the Hula case you get a screen protector as well as a back protector to keep everything scratch-free. The Hula case is available right now in nine colors for $19.99. iPhone 4 Bumper Giveaway Costing $175 million! To sort out the antenna problem with the iPhone 4, Apple is giving away free bumpers to all iPhone 4 owners. But as they don't just appear out of thin air, Apple is going to set aside $175 million of iPhone 4 revenue in the September quarter, according to Apple's CFO Peter Oppenheimer during the Q3 earnings conference call. But as in the same conference call they reveiled that they earned over $15 billion, shelling out $175 million for iPhone cases, won't be too much of a catastrophe for Apple. The $175 million might seem a huge amount for normal people like us, but compered the $1.5 billion Apple would have to pay for a full recall of the iPhone 4 as some industry analysts are predicting, giving away free cases is a much better option for Apple. Apple is getting ready to roll out their free Bumper case program to all iPhone 4 owners beginning tomorrow. Apple already stopped the order of Bumpers on their online store a few days ago and today the price decreased to $0.00. There is not telling what colors will be available to order for free and how many Bumper cases will be available until Apple will need to outsource some other cases for free. Keep your eye out on Gadgetmac for more info.